Much of the history of Bristol is founded on its port being a gateway to the British Empire. Hundreds of thousands of ships and sailors shifted wealth from one nation to another. Where ships and wealth sailed, so did pirates. This is the story of one unfortunate pirate, Captain Black. Join him on his final walk up Christmas Steps. The walk begins at the top of Broad St where it meets Corn St. At this point is located the Bristol Council Registry Office. Captain Black begins his journey behind the barred windows at the base of this building on the Broad St side. Walk down Broad St toward the ‘City Gates’ which form part of the Church of St John. Pass through the ‘City Gates’ and then head straight across the road toward the dual carriageway; cross the dual carriageway at the traffic-lights. You will then be on a traffic-island. Bearing to the left, cross the second stretch of the dual carriageway and head toward the Statue of St Bartholomew sat on his horse. Heads & Tales thanks Bristol City Council for their assistance with the creation of this story, which was recorded by Tony Chamberlain at the studios of Bristol Community FM. 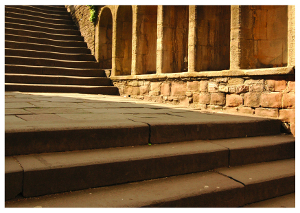 Photograph of Christmas Steps by William Datson.